Barbizon Midwest Review: Kickin' it Back into School Mode! 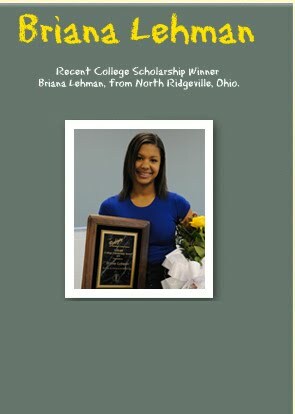 Barbizon is proud to announce its 2010, $100,000 College Scholarship Winner, Briana Lehman from the Barbizon in Akron, OH. Briana is so excited about the news especially since she is in the process of making collegiate plans within the next couple of years. What an AWESOME opportunity for a young lady who is so ambitious (she has a 4.3 GPA)! Stay tuned for more information as we will be featuring a mini-bio on Briana in the coming weeks! Since 1939, Barbizon has educated middle school and high school students in skills necessary for academic and personal success. One of our educational initiatives includes awarding a free four-year college tuition scholarship, valued up to $100,000. This scholarship can be applied to any school of the student’s choice. Winners will be selected around April 2011 in a random drawing in this year’s sweepstakes. Winners will be notified by certified mail on or about May 1, 2010. The winner has three years after graduation from high school to be accepted at a college. Students of all ages are welcome!